The University’s Disability Advisory Service brought to my attention that Policy Connect, (who describe themselves as “a cross-party think tank improving people’s lives by influencing policy”,) have recently published a report on Accessible VLEs (Twit: #AccessibleVLEs). Apparently there has been lots of interest in the findings and recommendations, from both education providers and government. The new legal requirements build on your existing obligations to disabled people under the Equality Act 2010 (or the Disability Discrimination Act 1995 in Northern Ireland). These say that all UK service providers must make ‘reasonable adjustments’ for disabled people. 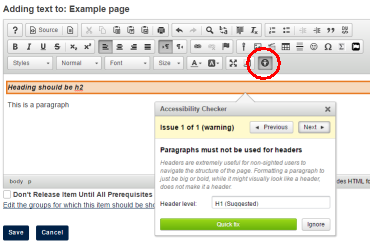 WebLearn’s WYSIWYG HTML page editor has a built-in accessibility checker. We strongly recommend that you use it so you can be confident that web pages authored within WebLearn are accessible to all users. The new regulations, in improving equal access to higher and further education, can – if implemented well – make an important contribution to meeting the Government’s ambition to create a more prosperous and equal Britain by growing our domestic talent pool and closing the disability employment and attainment gaps. The report’s recommendations are aimed at doing much more than simply achieving compliance with the regulations. They set out how the requirements can be met in such a way as to improve learning and education for all students whether disabled or not. The report begins with with the context of why digital accessibility is important in education. It starts with the recent history of inclusion and sets out how digital accessibility can make virtual learning environments (VLEs) a key learning tool for all users. Chapter 2 sets out what the new regulations will mean for educational leaders, lecturers and teachers, and what kind of information and data is included or exempt. Chapter 3 describes how the Government and sector bodies can help higher and further education institutions deliver on their obligations under the regulations – implementing these recommendations will be cost-effective and help consistency of application across the sector. Chapter 4 is targeted at the higher and further education institutions themselves and provides a strategic ‘how-to’ guide to implementation, with the objective of using the requirement for digital improvements to make education and learning better for all students.